pixel इन 5 चीज़ों में आधार कार्ड को लिंक करना हुआ अनिवार्य, जानें क्या हैं वो 5 चीज़ें ! इन 5 चीज़ों में आधार कार्ड को लिंक करना हुआ अनिवार्य, जानें क्या हैं वो 5 चीज़ें ! 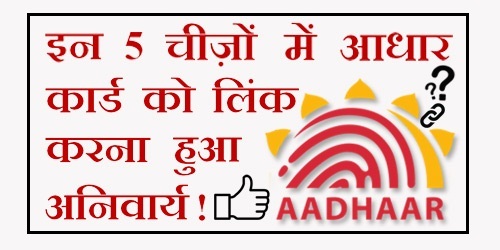 इसलिए जितना जल्दी हो सके अपने Mobile Number को अपने Aadhaar Card से Link करें | यदि आप अपने Mobile Number को अपने Aadhaar से Link करना सीखना चाहते हैं तो इसे ज़रूर पढ़ें - How to Link Aadhaar Card With Mobile Number (SIM) Online (IVRS) in Hindi ? 1.) How To Link Your Aadhaar Card With HDFC Bank Account (3 Methods) ? 2.) How To Link Aadhaar Card With Punjab National Bank Account Online ? 3.) How To Link Aadhaar Card With SBI Bank Account Online in Hindi ? 4.) How to Link Aadhaar Card With Bank Of Baroda Account Online in Hindi ? 5.) How To Link Aadhaar Card With Your IRCTC Account Online in Hindi ?